Dopplegangers of the wild! Reptilians belonging to two different continents have adapted to similarities in bio-geographical conditions with striking results. In 2011, my usual routine at home in Chennai would involve mornings spent working on my PhD thesis. After five years of extensive fieldwork, the monotony of city life had finally gotten to me and I was eagerly waiting for my next outdoor opportunity. I was pleasantly surprised, therefore, when I got the confirmation for an expedition to the Sinai desert in Egypt, in June. Over the next few days, I spent all my time on the internet, browsing about the diversity of reptile life of Sinai. This is a regular practice of mine, which concludes with the preparation of a target list from the region. As I ‘discovered’ more about Sinai online, I realised that it is an interesting biogeographic spot, lying at the confluence of three areas and hence sharing the species of these areas, viz. Asia, Mediterranean and northern Africa. With summer temperatures touching 50oC and an annual rainfall of less than50mm, Sinai is also one of the driest places on Earth. I left for Sinai on July 2, 2011, and spent about a month and a half there. The vast expanse of the desert and the remarkable diversity of reptiles amazed me. Along with my fellow field biologists and volunteers, we managed to find and see three snakes and 15 lizards within the time we were there. I got a chance to visit our own desert in Rajasthan while working on the Fan-throated Lizard, as part of my post-doctoral research. I have been travelling across the country to sample this lesser-known and poorly studied reptile, and one of the destinations turned out to be the western part of Rajasthan. School geography had taught me that the Thar desert, with summer temperatures of 50oC and an annual rainfall of less than 200mm, was one of the most inhospitable environments in India. I was expecting to see sandy landscapes with dunes everywhere. On the contrary, I found vast grasslands, gravel plains, sandstone formations and very few areas with sand dunes. I travelled to Rajasthan in May 2014 (yes, the hottest time of the year), visiting Mt. Abu and Jodhpur first and then Sam, a small village about 40km east of Jaisalmer. This is where I got to experience the actual Thar Desert. I had spent about a month and a half in Sinai, but with just two days in Thar, I had enough time to find, appreciate and make some interesting observations about the reptiles found here. At a distance, a tiny bright blue lizard attracted my eyes. It was sitting on top of a rock pile near our base camp in Sinai. I approached slowly with my camera; it was twelve noon and my thermometer showed 46oC! At first, the lizard moved away, but after some time, it did not bother. I was dazzled by the bright blue colour under the sharp sunlight and clicked away furiously at the fastest possible shutter speed. It was the Sinai Agama (Pseudotrapelus siniatus); the males of this species put up vibrant displays during the breeding season to maintain territories and attract females. 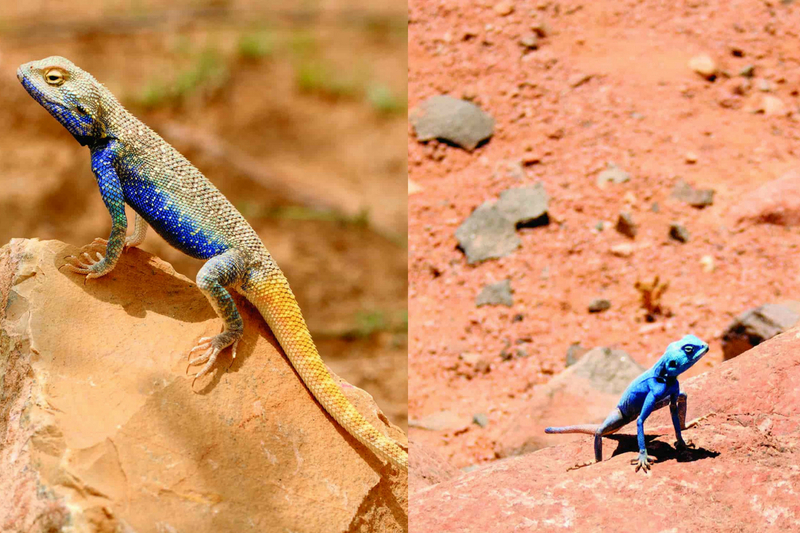 It fell akin to déjà vu, when I found a blue-coloured lizard in the Thar Desert as well! It was late in the day and after running behind Spiny-tailed Lizards all morning, I was resting in my room. Just outside, I noticed the familiar blue. It was not very hot this time (39 degrees Celcius) and this lizard was comparatively shy. The Brilliant Agama (Trapelus agilis) also displays for the same reasons as the Sinai Agama. Based on the faunal and floral similarity, biogeographers classify the area from northwestern Africa to northwestern India as the Saharo- Arabian biogeographic region. In terms of area, this region is vast; it starts from the east of North Africa, includes Middle East Asia and a relatively small part juts into western India. Other than this biogeographic relatedness, one can see amazingly similar adaptation to these extreme environments amongst various species. According to the theory of convergent evolution, unrelated species do evolve similar morphological characters when they use similar habitats and occupy similar niches. The Brilliant Agama is more closely related to the Desert Agama (Trapelus pallidus) than it is to the Sinai Agama. But male and female Desert Agamas look similar to each other, as the males do not acquire any bright colours during the breeding season. Habitat-wise, the Sinai Agama is found in rocky areas of Sinai while the Brilliant and the Desert Agamas prefer areas with gravel. Their bright blue colour and time of display explain the remarkable similarity between these two distantly related agamids. Rajasthan Toad-headed Agama (Bufoniceps laungwalaensis) is a lizard endemic to Thar. Bufoniceps lizards are fossorial lizards, adapted to living in sand dunes with less than 2% vegetation. When threatened, the lizard buries itself in the sand. The specialised head has nostrils which are pushed up to the top. This probably helps the lizard snorkel in the sand, while not allowing it to enter its nostrils. The Middle East also has similar looking, and hence similarly-named, Toad-headed agamas (Phrynocephalus spp.) But these agamas are only distantly related to their counterpart from India. Despite this, the similarity doesn’t end at just the head. All these (and many other psammophilous or sand-loving) lizards display fringed toes, an adaptation that aids efficient locomotion in the sand. The very first lizard I saw in Sinai was an afringe-toed lizard, Acanthodactylus bosikanus. These are very swift lizards, adapted to live and move in sandy tracts. Similarly, in India, we have the Indian Fringe-toed Lizard (Acanthodactylus cantoris). When approached, these lizards run fast over the sand and hide in their burrows. Acanthodactylus lizards have a behavioural adaptation – during mid-day when the sand gets very hot, they lift their feet one after the other, to reduce contact with the hot sand. This is called ‘thermal dance’. 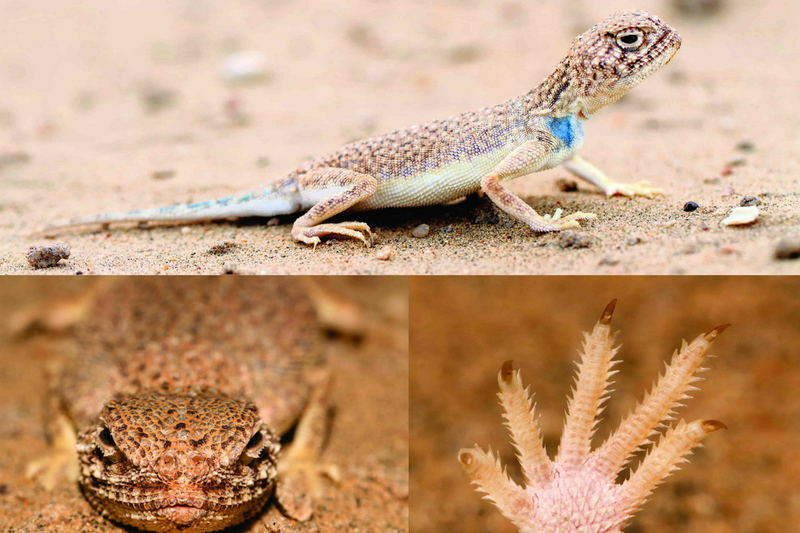 I have noticed this behaviour in the Sinai Agama, and Ishan Agarwal, a friend of mine who has worked on the reptiles of Rajasthan, has observed the Brilliant Agama and a lacertid (Ophisops sp.) do this in the Thar Desert. Nocturnal reptiles of the desert are equally fascinating. In Sinai, there are two species of fan-toed geckos (Ptyodactylus guttatus and P. hasselquistii), which are mostly found on vertical rocks. These geckos have unique toe-pads, perfectly adapted for gripping dusty rocks. In Thar, a Hemidactylus spp. shows a similar adaptation. During one of the night drives on the sand plateaus of Sinai, I found a ground gecko named the Elegant Gecko (Stenodactylus sthenodactylus). While in Thar, on one of the nights I spotted the very similar looking Sindh Sand Gecko (Crossobamon orientalis). The two geckos were earlier placed in the same genus Stenodactylus because of their similarities. Similarly, the Persian Sand Gecko (Microgecko persicus), a species recently discovered in India and the Natterer’s Pigmy Gecko (Tropiocolotes nattereri) of Sinai were also placed in the same genus Tropiocolotes before. During the end of my trip in Sinai, I found a tiny gecko on a rocky coast of the Red Sea, hopping from rock to rock. It was a Naked-toed Gecko (Cyrtopodium scabrum). This species is even found in the Thar. Ishan, in his recently published findings, mentions that this gecko is a human commensal; they thrive in human habitations and have probably been moved around by people over the ancient trade routes. Unlike other reptiles, finding snakes is difficult. I saw three species in Sinai, but my wishlist had eight. In Thar, I only got two, but this was a good number considering my short trip. When someone talks about snakes in a desert, most people will imagine side-winding tracts left in the sand dunes. There are a few vipers which do this. One morning in Sinai, a Bedouin field tracker spotted tracks of a viper while we were returning back. He managed to trace the tracks for a good 200 metres or so but eventually lost them in a bush. I was dejected at missing a chance to see a snake, but as luck would have it, I got to see two vipers while on the trip. Both, the Horned Desert Viper (Cerastes cerastes) and the Palestine Saw-scaled Viper (Echis coloratus), are known to side-wind. In Thar, we have a distinct subspecies of the Saw-scaled Viper (Echis carinatus sochureki) which is also famous for its side-winding action when moving over the sand dunes. The sochukeri subspecies of the Saw-scaled viper is known to side-wind on the sand, a locomotion strategy used by several snakes found in the deserts of Arabia and Africa. A unique radiation of snakes, the sand snakes (Psammophis sps.) are found from the Middle East to South Asia. These are thin and long snakes, good climbers, but mostly found on the ground. Sinai has only one species, Psammophis aegyptius, a common snake all over Egypt. The Schokar’s Sand Snake (Psammophis schokari) of Thar Desert is a very similar snake. The resemblance is so uncanny, that observing one in a village in Thar, immediately reminded me of the Egyptian equal. Spiny-tailed lizards (Uromastyx spp.) seem to be right out of a Jurassic Park movie! A stout body, an imposing turtle-like head and a spiny tail, all make for a menacing appearance. But despite this threatening exterior, the lizards are quite docile and surprisingly herbivorous. The Bedouin people of Sinai call them ‘daab’. There are two species found here, the Egyptian Spiny-tailed Lizard (Uromastyx aegyptia) and the Ornate Spiny-tailed Lizard (Uromastyx ornata). Both are relatively rare in many places because of increased demands in the pet trade and for their body parts. I saw the colourful Ornate Spiny-tailed Lizard in Sinai from the car, while a pair was basking on some rocks. Although genetically related and very similar in appearance, the Indian Spiny-tailed Lizard and the Ornate Spiny-tailed Lizard have different habitat preferences. When I entered Sam, I again felt like I was entering the Jurassic era. The Indian Spiny-tailed Lizard (Uromastyx hardwickii) is one of the most common lizards here. Locally called ‘sanda’, it is a Schedule II species according to the Wildlife Protection Act of India, giving it the same degree of protection as a Wild dog or a King Cobra. Although all the three spiny-tailed lizards are burrowers, their habitats are quite different. The Egyptian variety is found in sandstone area and burrows under these stones, the Ornate one burrows in rubbles of rocks, while the Indian species dig their own burrows in the sand. Interestingly, the Indian species close their burrows after sunset. I was not very lucky with skinks while in Sinai; the only species I saw was the Ocellated Skink (Chalcides ocellatus) in a Bedouin garden, drinking water from a trough. The Ocellated Skink is widespread, found in northern Africa and the southern Mediterranean and up to Pakistan in the east. In Thar, we have a unique nocturnal skink, called the Sandfish (Ophiomorus raithmai). They are aptly named, as they have highly reduced and almost vestigial legs and literally swim in the sand. My friend N.S. Achyuthan, who recently surveyed Morocco in northern Africa for reptiles, found a similar looking species called the Duméril’s Wedge-snouted Skink (Chalcides sphenopsiformis). Interestingly, although similar in appearance to the Sandfish, this species belongs to the same genus as the Ocellated Skink but bears no resemblance with it. One of the finest examples of convergent evolution! The Sandfish has over the years perfected characteristics required for a life spent swimming in the sand. Surprisingly, the unrelated Duméril’s Wedge-snouted Skink also displays some of these morphological characteristics. Apart from reptiles, there are several small mammals like the hedgehog, Desert Fox, Desert Cat and gerbils found in the Thar Desert, all of which have counterparts in the Sinai and perhaps in other deserts across the world. I’m sure that this phenomenon will extend to birds, amphibians and other groups of animals too. These equivalents share similar morphological or behavioural characteristics shaped by thousands of years of convergent evolution; while some characteristics are common because they may be closely related. Deepak, a post-doc at the Indian Institute of Science, is a herpetologist with keen interest in the ecology of amphibians and reptiles. He has contributed several scientific and popular articles on Peninsular Indian herpetofauna and is presently working on understanding the biogeography of the Fan-throated lizard.